I am grateful for many things in my life, I always search for new ways to be a pleasure in the sight of God, I choose to believe the best in everyone and I have faith that “it’ll all work out” because my faith is in God through my Lord and Savior Jesus Christ. I am watching history unfold and am humbled that Andre Soriano of Andre Soriano Fashionchose me to be a part of it. I have traveled many roads and cut many paths some unorthodox, most conventional, always with God as my compass. Be mindful of the seeds you sow for they will bear the fruits of your future that will live on as your legacy for generations to come. Will you choose to follow the roads of others or will you cut your own path? This is the question I will leave you with. All glory to God!! !… I can’t say thank you enough to each of you.. 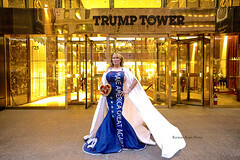 Thank you Andre Soriano for the great honor of choosing me to represent the #MakeAmericaGreatAgain Gown, an Andre Soriano Fashion Couture original, I am truly humbled with great respect. Thank you Rachael Robin Photo for these influential, timeless images that I am humbled to be a part of. Thank you to everyone for your generous kindness. HAPPY 1st ANNIVERSARY!!! 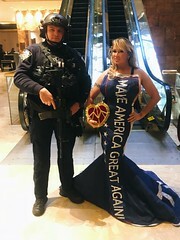 A Tribute to @realdonaldtrump President Trump, One Nation under God, indivisible, with Liberty and Justice for All!!! Click to follow YOUR dreams and receive the gift of success through new posts by email. Lisa Christiansen’s first job was at the age of 2 years old when she worked at the TSA-LA-GI Indian Village making mud pies for the tourists. During my travels, I stumbled upon Dr. Lisa Christiansen and her work. She’s an extraordinary motivational speaker, life coach, business consultant, entrepreneur, and best-selling author.